Leeuwenbosch Shearers Lodge - Paterson Accommodation. Set back from the Country House, Shearers Lodge offers four contemporary double suites, overlooking the tranquil gardens from the shade of a wide veranda. 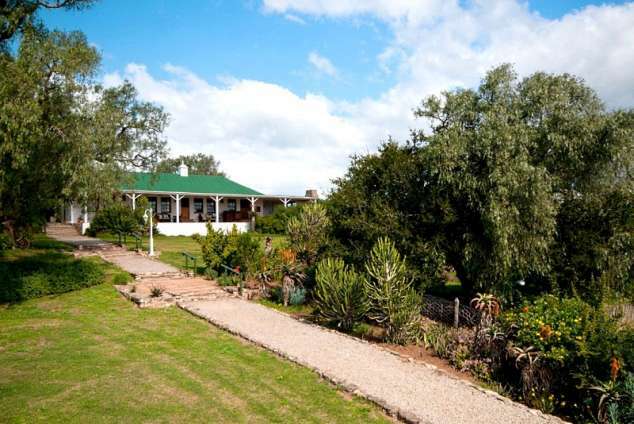 Beautifully converted from the original shearing shed, Shearer’s offers an ideal base from which to explore the surrounding areas of the Eastern Cape. Addo Elephant National Park lies just 30kms away; the 1820 Settlers Monument in historical Grahamstown just a 30 minute drive along the N2 highway, and the Born Free Predator Rehabilitation Centre is 10 minutes from the Leeuwenbosch gate. The beautiful beaches of Kenton-on-Sea and Port Alfred are also easily accessed for a day on the beach. Day trip game drives into the Amakhala Game Reserve can be arranged, if required. Guests can savour a quiet moment in the dim stillness of the 19th-century stone chapel; enjoy high tea in the shade of the verandah or sit late into the night in the convivial stone-walled cellar bar. This wonderful homestead has been in the Fowlds family for five generations, and the family takes great pleasure in sharing its remarkable Southern African heritage. Guests can also arrange, as an optional extra, game drives, walks and river cruises, through the scenic wilderness that is Amakhala Game Reserve. Observe the wide diversity of creatures that make this land their home guided by informative and experienced guides. From elephants to porcupines, rhino to lion and springbuck to exquisite birdlife, all are protected with a passion. Approximately 50km from Port Elizabeth is an intersection, keep left on the N2 towards Grahamstown. From the intersection travel for a further 13km towards Amakhala Game Reserve (see road signs of the various lodges along the way). 113 page views since 11 Oct, 2018.